A new study by Wood Mackenzie on what to expect from global oil and gas exploration in the year ahead Global Exploration: What to look for in 2017 shows that exploration should return to profitability in 2017 after five years of only single-digit returns. The Majors and a handful of bolder Independents will drill most of the wells to watch, as in both 2015 and 2016. Wood Mackenzie expects the best discoveries to come from new plays and frontiers, despite greater emphasis on infrastructure-led drilling from many explorers. “More than half of the volumes are expected to be found in deep water. Here some well costs will fall to USD 30 million or less, with full-cycle economics that are positive at less than USD 50 per barrel,” Dr Latham says. 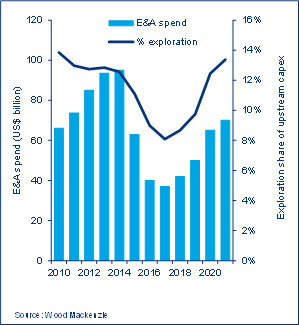 According to Wood Mackenzie’s report, the industry has cut exploration deeper than other upstream spending. Its share of upstream investment will dip to a new low of just 8% in 2017. An eventual return to historic norms – around one dollar in seven – depends on oil price recovery. Wood Mackenzie expects the Brent price to rise sharply from 2019, averaging US$77 per barrel in real terms for the year. If this happens, then recovery in exploration spend will follow a year or two later. “The industry is focusing on acreage capture and re-loading for the longer term. Companies willing to sign acreage with firm 2017 wells may be spoilt for choice. A spate of new licensing in outer slope plays will continue as explorers digest news of better-than-expected reservoir quality and source rock potential in these ultra-deepwater settings,” says Dr Latham. Exploration for pipe gas opportunities near under-supplied markets such as parts of North Africa, Eastern Europe and Latin America. Over-supplied LNG plays will be de-emphasised. High-cost frontiers, such as the ice-impacted offshore Arctic and extreme high pressure/high temperature plays, will be shunned. “After a decade in the doldrums, the Majors’ returns from conventional exploration improved to nearly 10% in 2015. The rest of the industry is heading in the same direction. Fewer, better wells promise a brighter future for explorers,” Dr Latham added.